After years of Winter travelling in Australia, including two "lets go all the way around" trips, this year we are taking it easy. 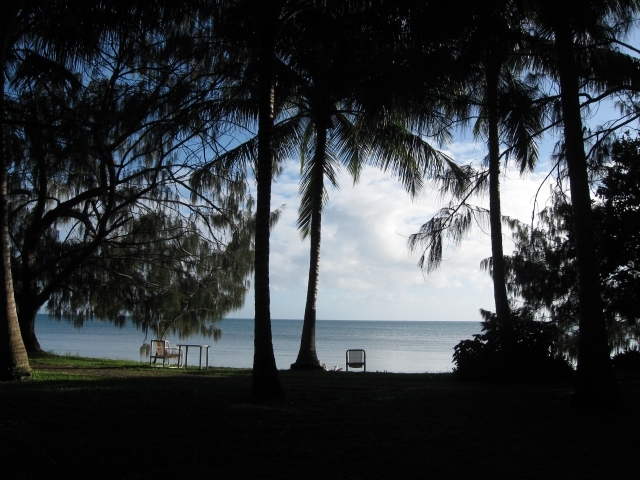 So easy, that our first port of call was a week at Cape Hillsborough. We've been there twice before in 2006 and 2008. We loved it in 2006 and were rained off in 2008, so we were really looking forward to another visit. It was fabulous as always. The camping area is embedded in a National Park and the walks start from your doorstep (as does the beach). 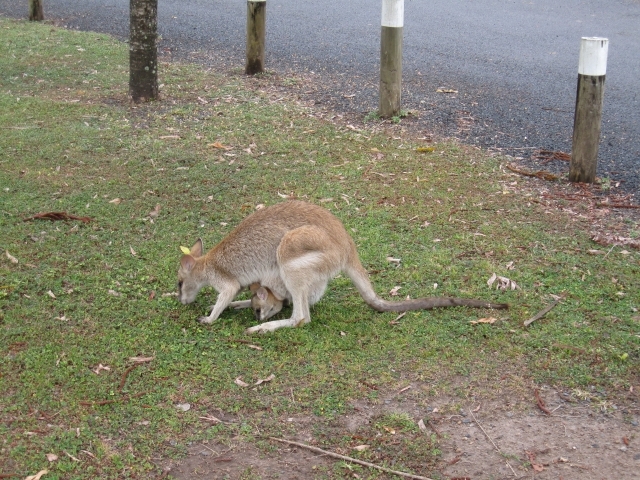 But who needs to go anywhere when the full time local residents come and visit you. 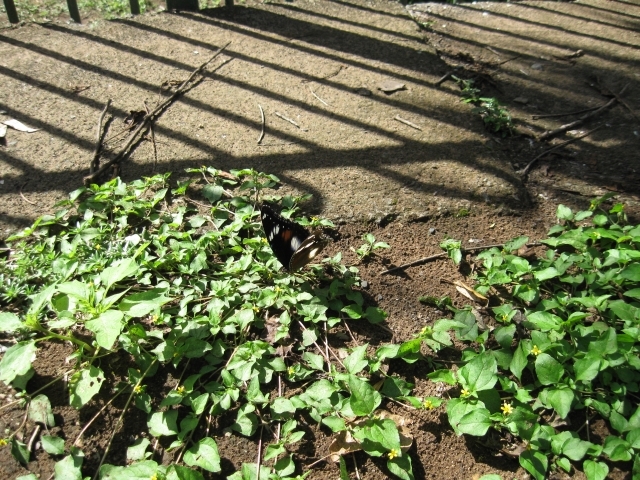 In her very first attempt to photograph a butterfly with a new digital camera Jan snapped this of a Common Eggfly (we think) exploring our site. Many different species were around but we never caught another butterfly in our lens. But we saw thousands both in camp and on walks. 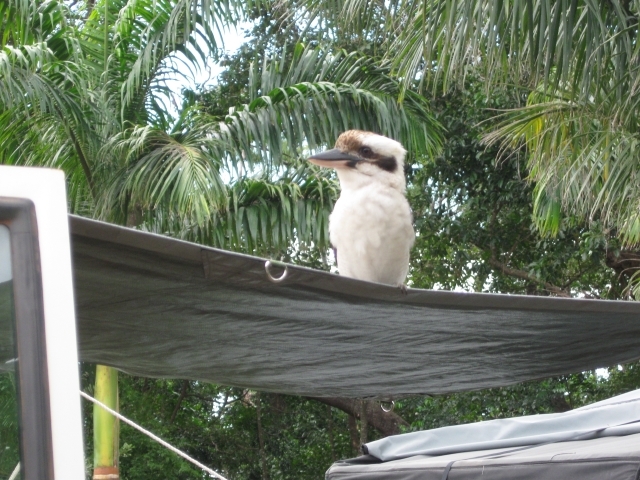 Every day about 4 pm a flock of Kookaburras would roll up and expect a feed. They never actually threatened us, but they are pretty menacing and have a powerful beak from chomping through lizards and grasshoppers. This guy took up a station on our tarpolin and when I pointed our umbrella at him he just opened his beak and prepared to bit it. A neighbour told us the people at this site before us had been feeding them bits of meat each afternoon. Yes some of them sat in old gum trees. This is what the coast looks like, with Jan for scale. 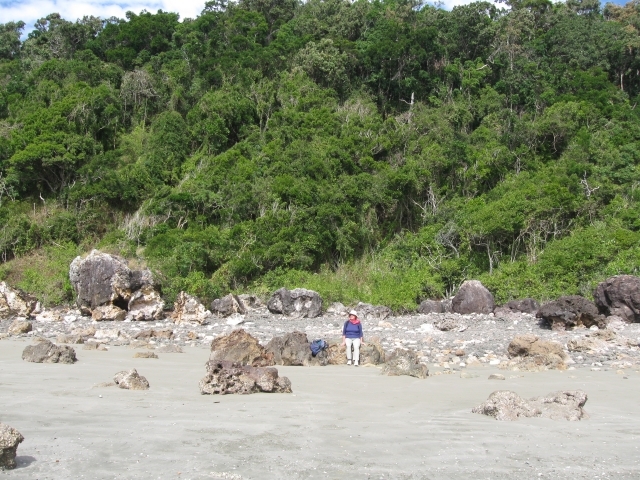 It is a big boulder beach then a steep slope covered with tropical bush plus hoop pines and other uniquely Aussi vegetation. There was actully quite a bit of storm damage from Cyclone Ului which came ashore North of here on March 22nd. The vegetation is adapted to this sort of thing but a few big trees had still come down and some other trees lost their vegetation. It had recovered well after just a couple of months. 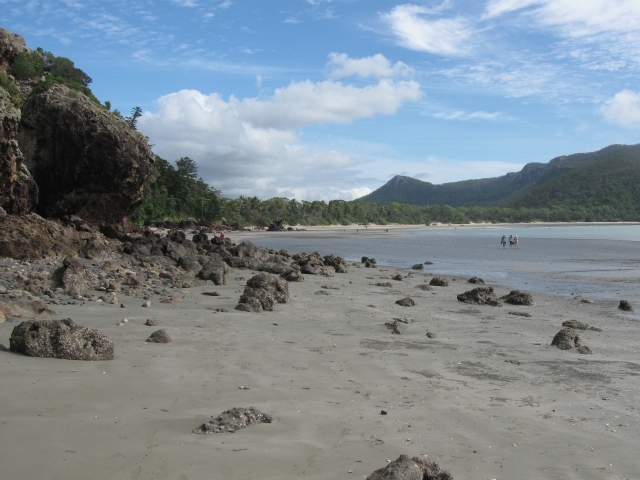 This second photo is looking back towards the sandy beach and to the camping area. There are extensive mud flats and you can see some people treking across to see the sights. You can also see how the camping area is quite low so it gets hammered by the cyclones when they do come in. 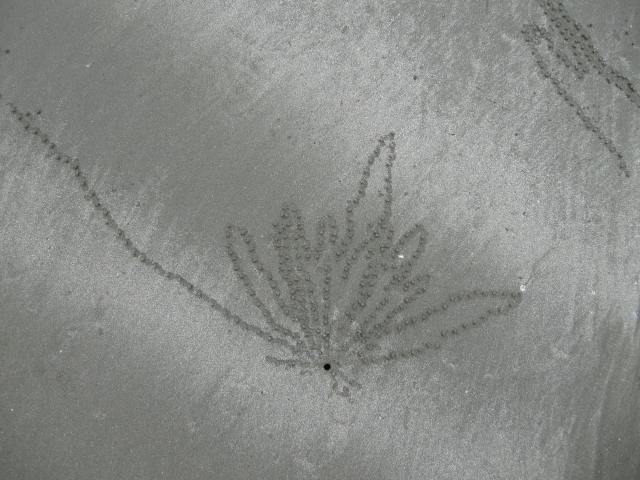 One of the things to see while you are trekking across the beach below the high tide line is beautiful patterns made by tiny crabs using little balls of sand. Each time the tide goes out they start their art project again, and each time the tide comes in the art all gets washed away. 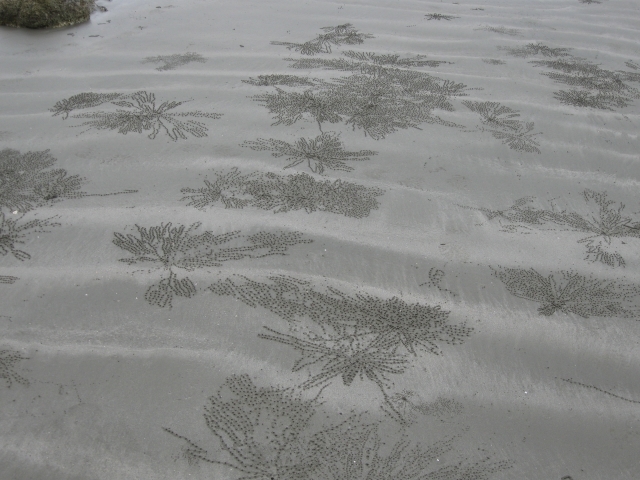 We don't know why they do it, but the entire beach is covered in some places by their amazing designs. In this closer version you can see the little hole where one crab emerges to do the sidewalk art. These same crabs are found on other beaches in these parts, so it isn't just here. Millions of crabs doing their artwork over and over each day. Although the cyclone damage has been mostly repaired here, it was worse further North where the winds were stronger. However, there were a few local services which have yet to be fully restored. 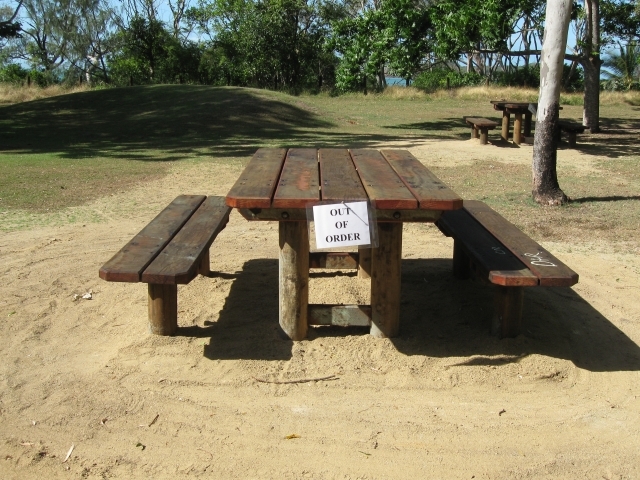 The picnic area had been spruced up but a few things weren't yet online. Readers are encouraged to click on the photo to enlarge is and figure out what the problem might be. All suggestions welcome. (This is part of my funny Australian signs series -- they do have a way with signs sometimes). 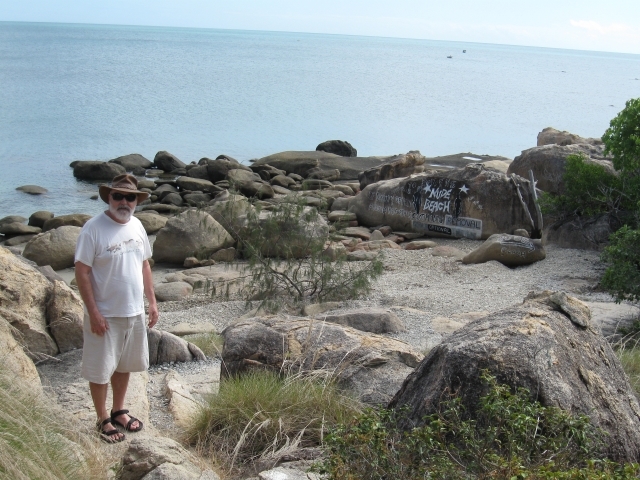 After a nice week at Cape Hillsborough we headed up to another favourite place: Bowen. This is the chair from which I was typing (well, for a moment, but you can't see the screen in the glare so I moved back inside). We have been here for one week and are staying in Bowen for another. I didn't move back inside Trev our vehicle either. We rented a little unit by the sea. Luxury. We don't have to put the bed planks away to get to the food cupboard each morning. We're actually moving to a different unit tomorrow so we will be closer to our favourite beach Horseshoe Bay. At the moment we half to walk a quarter of an hour to get there. Horseshoe Bay looks like this...if it is a crowded time of day. 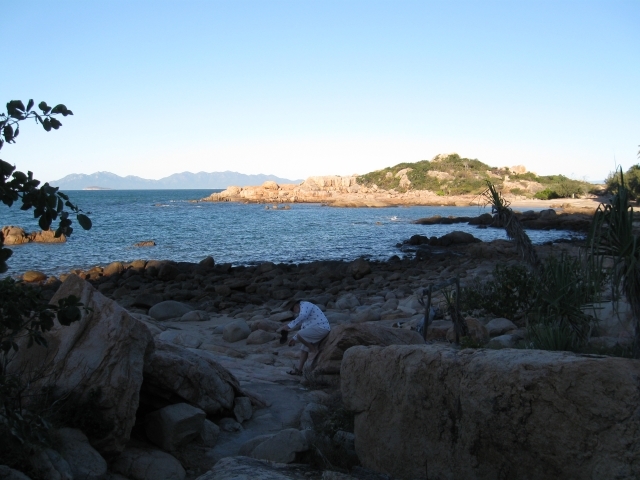 A fantastic little bay surrounded by large rose coloured granite boulders. In our new unit we will be about 20 steps from this beach. We will still need to head off on walking trails to help keep fit, but there are plenty of those. 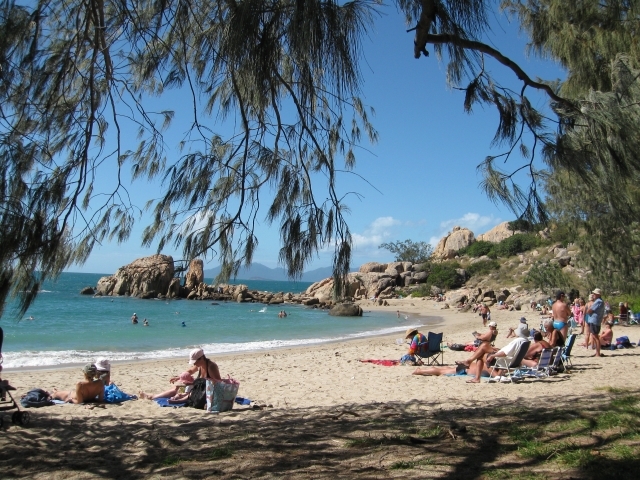 One trail we've already checked out is the one to coral bay, which is also the only "clothes optional" beach in Bowen. In order to keep outsiders from being "offended" and getting shut down, they have a very nicely painted rock before you get to the beach. Here is Steve examining the quality of the rock art. Another trail we've done is over to another bay called Murray Bay. The Murray Bay montage also graces the opening of this report. It is similar in structure to Horeseshoe Bay (rose granite boulders and sand beachs) but almost empty. There are 3 houses there, one of which is for sale and was also for sale in 2008 when we were last here. After walking along the beach Steve pauses to get the rose grit our of his sandels. It may be pretty but it sure is gritty. When we're on the trail we build up a hearty appetite, and nothing satisfies like a Jochheim's pie. 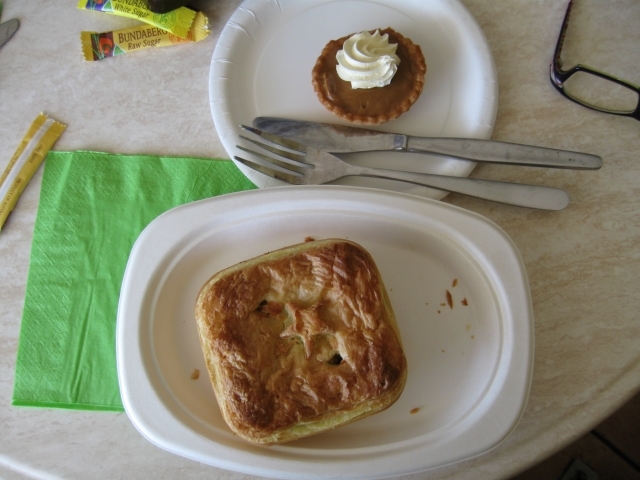 Jan took a photo of her Hugh Jackman "Hunky Australian" pie. By way of explanation, Jochheim's bakery became principal suppliers to Baz Luhrmann and co while Australia the movied was filmed in Bowen. The bakery has an entire wall devoted to signed photos, etc. The location people found that Bowen (pop 7500-ish) could be converted into WW2 Darwin and much of the film was made here. In fact, the town is so proud they have "BOWENWOOD" painted on a big watertank (take that Peter Jackson). Another Hollywood fetish can be seen on the pie: that star is just like the ones on Hollywood Boulevard "walk of fame". We are still deciding where to go next. No change there! The plan is to continue North to a few places we've enjoyed before. Lucinda beckons where we have seen both Beach Stone Curlews and Bush Stone Curlews. Plus there are a series of great waterfalls with camping ahead of us. We'll be keeping in touch (and updating the web site) a bit more easily because we splashed out a wireless Telstra Next Gen modem. Now we can do boadband internet from our campsite -- although we have already discoved a few places which don't have the mobile phone coverage we rely on. Acknowledgments: Thanks to Jan for being a patient and kind travelling companion. Special thanks to our Trev the Troopy sitters Bev and John.